‘Reverse strawberries’ are now being sold in Australian nurseries. The reverse strawberry is white on the outside with red seeds. It is also sometimes referred to as a ‘pineberry’ as it has a pineapple tasting tang. The fruit is the result of cross-breeding between a wild South American strawberry called Fragaria chiloensis and a Norther American strawberry called Fragaria virginiana. Reverse strawberries were first sold commercially in the US in 2012 and are also available in Europe. 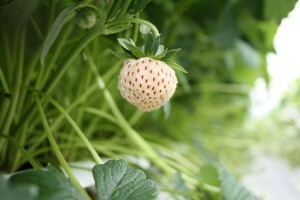 It is not a self-pollinating plant and a regular strawberry plant needs to be near it to help the pollination process. The fruit will be introduced to Australia by United Nurseries, a group of eight Australian wholesale nurseries. It is currently available for purchase at selected Bunnings Warehouse stores across the country and will continue to be rolled out into more stores across the next month. At the same time as importing the reverse strawberry, United Nurseries is introducing the Bubbleberry and the Strasberry to Australian nurseries. The Bubbleberry is described as tasting like bubble-gum and the srtasberry is a raspberry and strawberry combination.